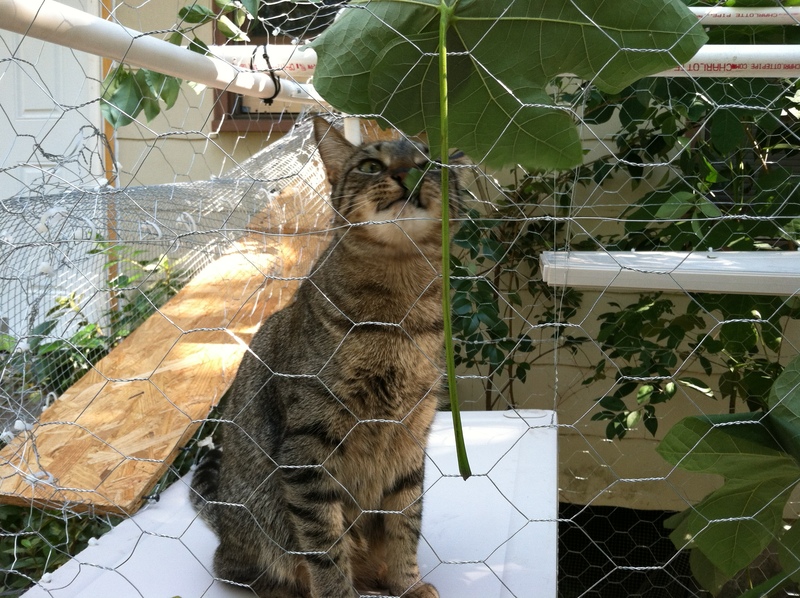 Your cat looks out the window all day, why not let your cat go outside safely whenever it wants. 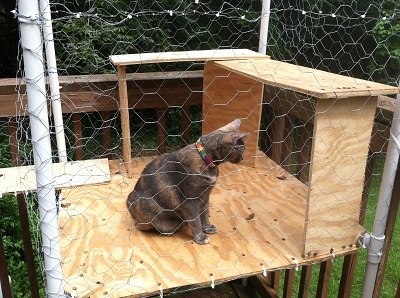 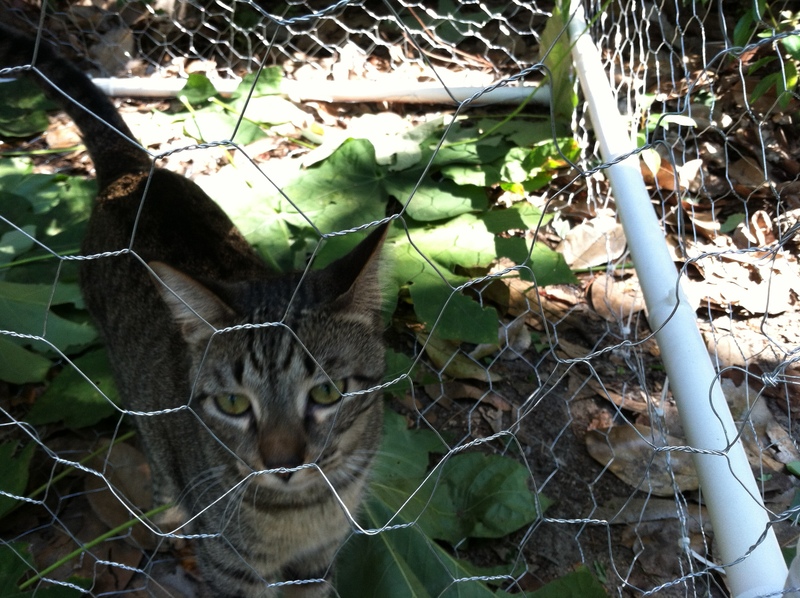 The second version of the outdoor enclosure is built in a new location for my sweet kitty named Lucy. This version improved upon the design of the first enclosure and also accommodates a different location by being built on stilts. 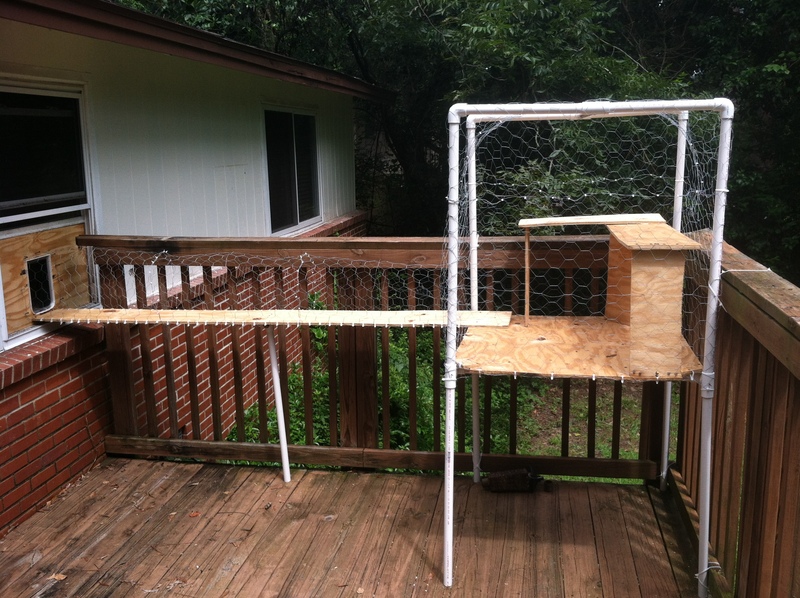 Used in this project is 5x 10' sections of 2'' PVC pipe, 11x T couplers, 4x corner couplers, and one 4' x 8' piece of 4 ply wood. 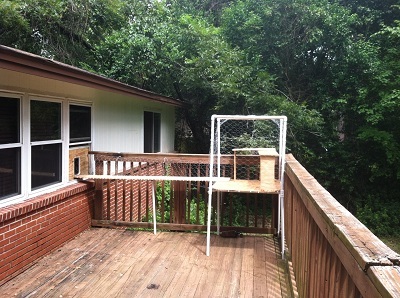 The enclosure is placed in an unused section of our deck with a ramp leading from the inside to the larger enclosed area at the corner of the deck. 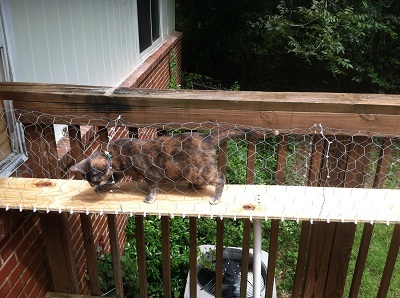 Inside the enclosure a small shelf was built so the cat can sit above the edge of the deck and look out over the whole back yard. 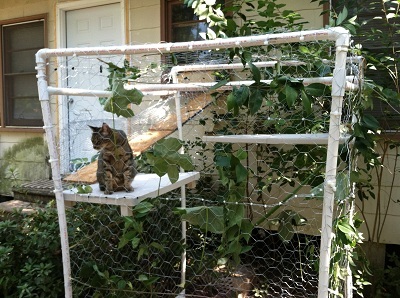 The shelf also provides shade during the heat of the day and a way for the cat to feel protected from above. A medium sized cat door was cut and placed inside a larger piece of wood that is braced inside a window frame. 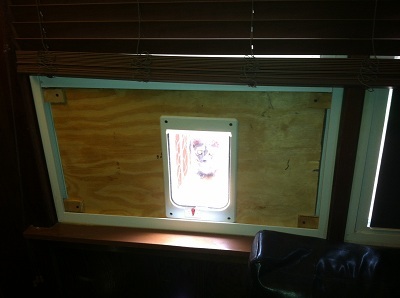 Weather stripping provides a tight seal against the elements. 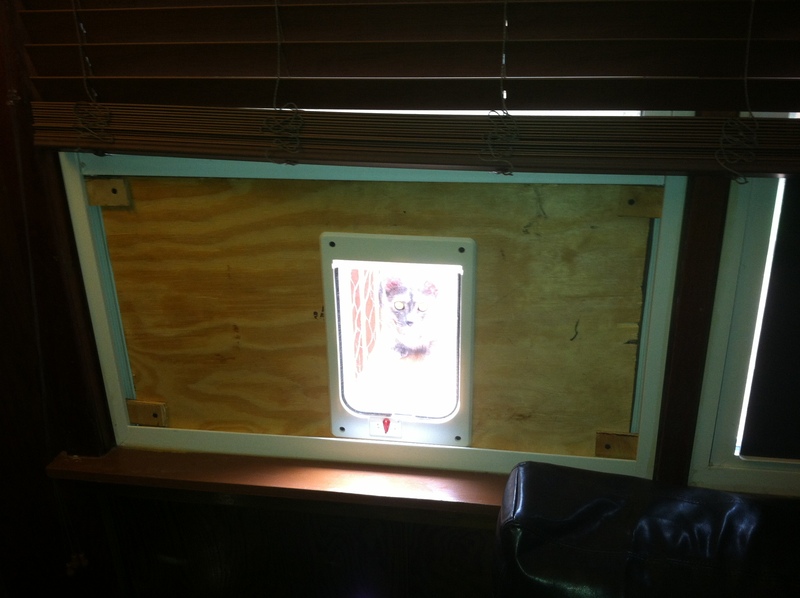 In the second picture you can see small braces that are attached from the inside and an awesome shot of Lucy close to the cat door. 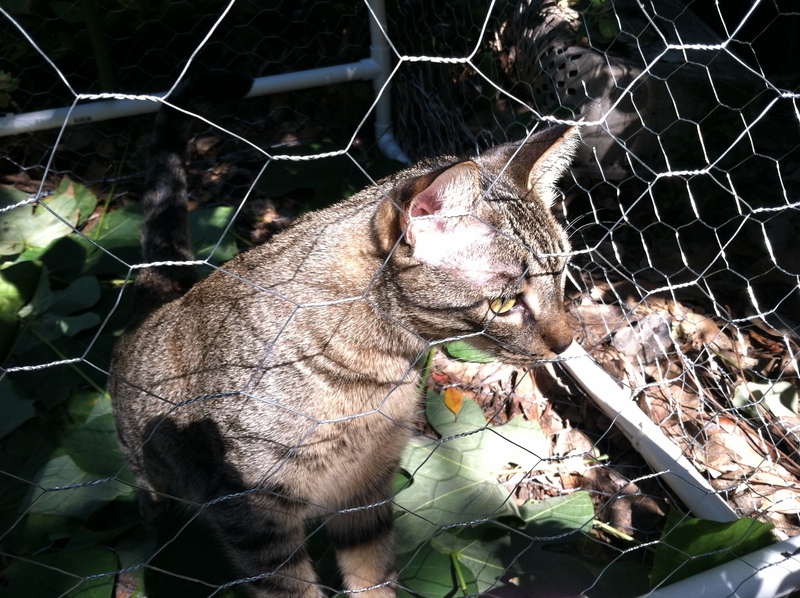 Here is my kitty hanging out in the sun and enjoying the new freedom that this type of enclosure provides. Lucy keeps a watchful eye over the back yard and enjoys sleeping on the shelf in the sun. 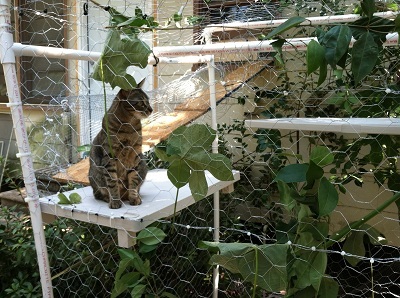 The ramp provides enough height so the cat can easily walk to and from the enclosure and turn around if she changes her mind. 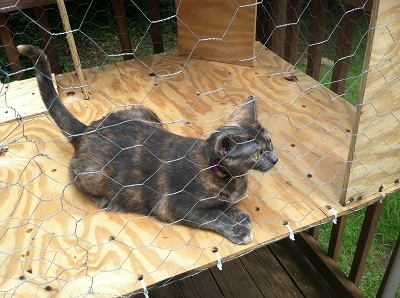 Lucy will often sleep on the ramp right outside the cat door so she can still see what is going on inside. The first version of the outside cat enclosure was built for one of my room mates' cat Tesla. 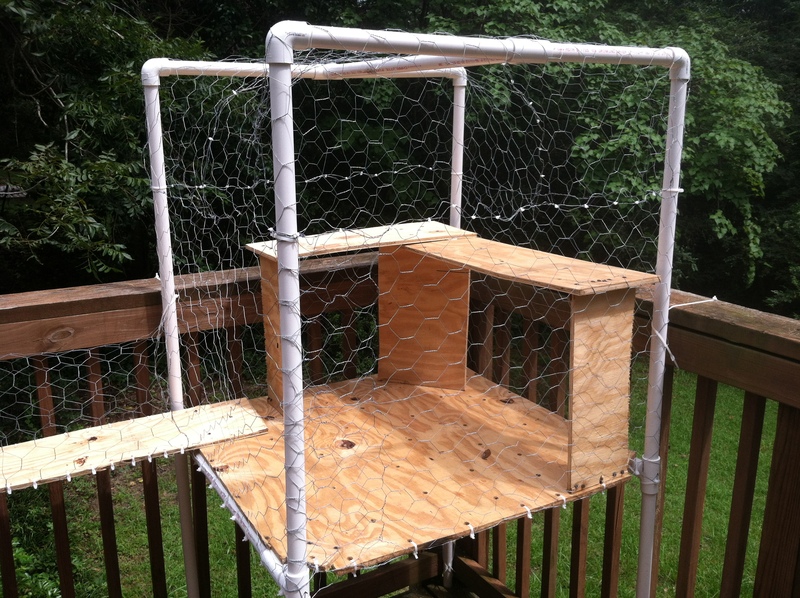 Constructed out of 2'' PVC pipe and 4'' chicken wire. 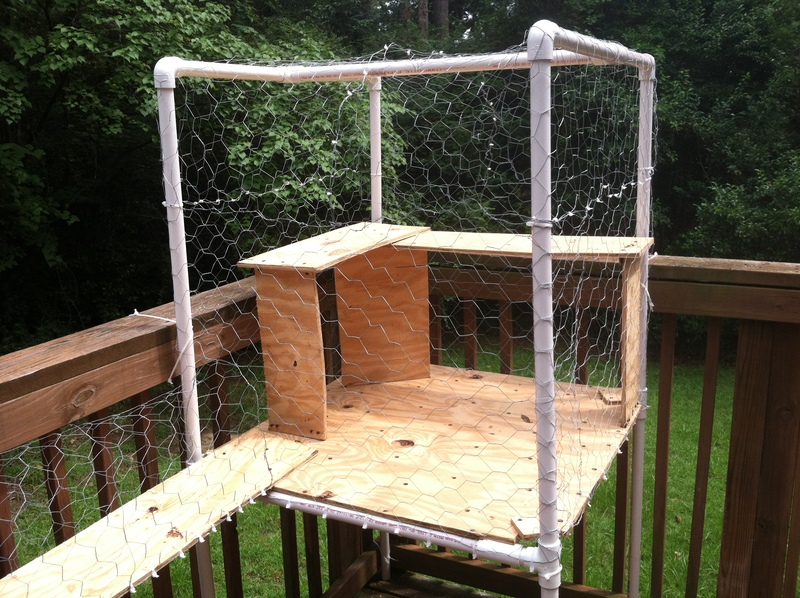 The entire enclosure is wrapped in the chicken wire with a small hole cut on the side where the ramp connects. 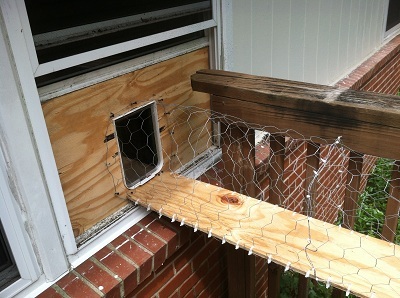 The ramp connects to a small catdoor installed in a piece of wood installed in the window. 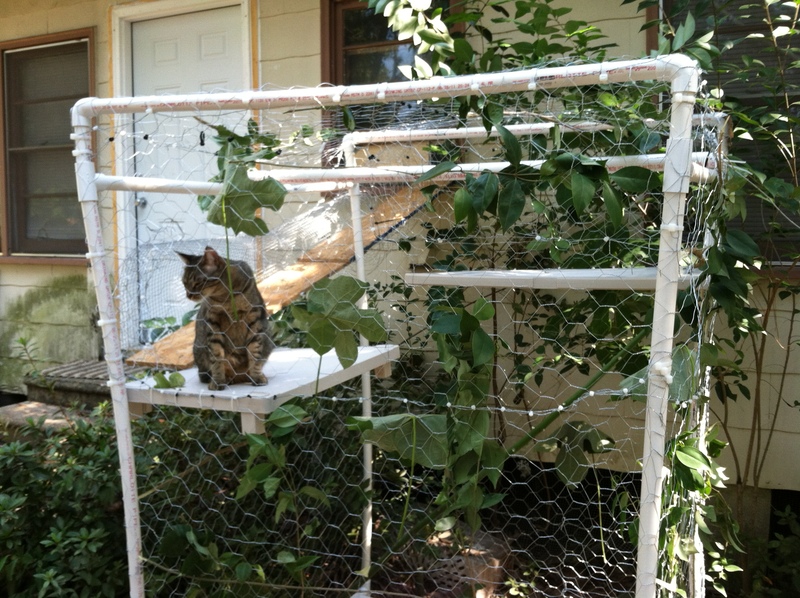 The cat can go outside any time she wants, the cat door has a locking mechanism so we can block off the outside if the need arises. 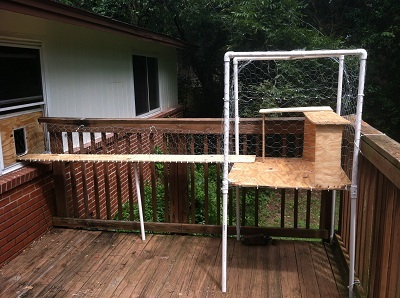 The enclosure stands 6 feet tall and is 4 x 4 feet at the base. Several platforms were installed and hung from the supporting beams so Tesla could jump her way to the bottom or hang out on any level she wanted. 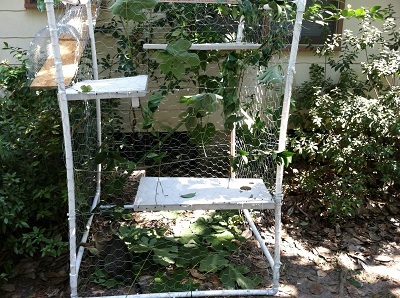 The platforms were salvaged from a broken set of plastic drawers, holes were drilled so water would not collect. Here is Tesla at the bottom of the enclosure where she could nap outside in the shade. 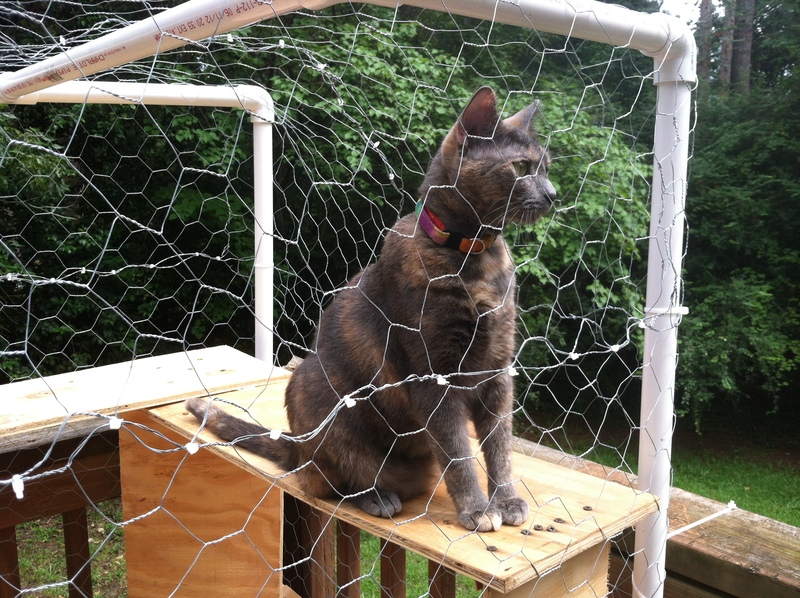 Tesla is a smaller cat and her head is much bigger than the holes in the chicken wire and also prevents other cats, dogs, and large rodents from entering the house through the cat door. 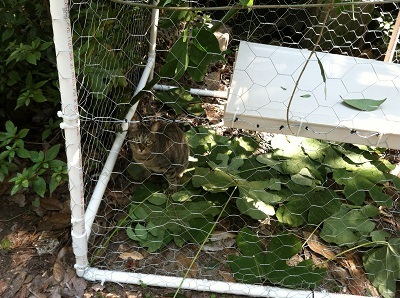 Here is another shot of the bottom of the enclosure and also Tesla hanging out on the platform that leads to the ramp. 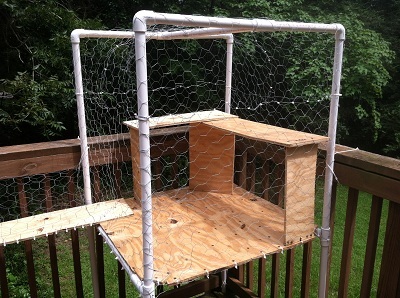 You can make out a small hole in the side of the enclosure where it meets the enclosed ramp. These show Tesla on the top platform with a side shot of the setup. 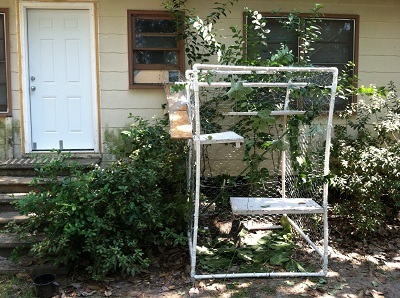 Outside Cat Enclosure was created by Travis Brown, email: WarriorRocker@gmail.com.